This video introduces the important idea of clauses. So, first of all, big idea number one, every clause must have a subject and a full verb. See, a clause is like a sentence in miniature. And there may be many of these clauses inside a full complex sentence. The reason I emphasize, full verb, is to make the point that it's not enough to have a verb form, such as a participle or definitive. That's not enough for a clause. A clause demands a full bona fide verb. These are distinctions we'll explore a little more in the series of videos on verb form. 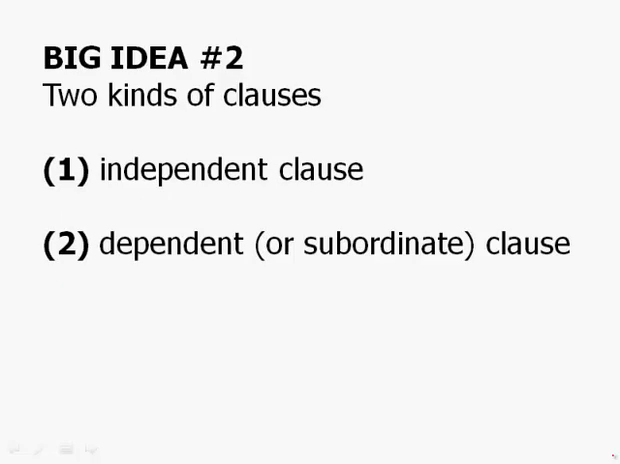 Big idea number two, there are two kinds of clauses, independent clauses and dependent clauses. An independent clause can stand as it, on its own as a complete sentence. And in fact, any sentence that simply has one noun and one verb in it, that entire sentence is an independent clause. A dependent clause is a modifier. It cannot stand on its own as a complete sentence. It's playing the role of the modifier modifying something about the independent clause of the sentence. So, for example, this particular sentence which is of, a Beatles song. When I cannot sing my heart, I can only speak my mind. The first word, when, is a subordinate conjunction. So that's telling us it's introducing a dependent clause, a subordinate clause. Within the subordinate clause, we have a subject, the pronoun and we have a verb. So full subject and verb. Notice that this dependent clause, when I cannot speak my heart, when I cannot sing my heart, this cannot stand alone as a full sentence. It's only a modifier. Meanwhile, the independent clause, this is actually what could stand alone as a complete sentence without the modifier. And again, we have a subject and a verb, this subject and this verb are, in fact, the main subject and the main verb of the whole sentence. And that leads us to big idea number three. Every sentence must have at least one independent clause. If it has that one independent clause, the subject of that clause is the main subject of the sentence. The main, the verb of that clause is the main verb of the sentence. Now, it's important to point out, every sentence must have at least one independent clause. Many of the sentences you'll see on the GMAT actually have two, three, even four different clauses. There are some very complex sentences on the GMAT. Every single one of them has to have at least one independent clause.